An expertly crafted multiband compressor with the inclusion of one- and two-band versions coming as a very welcome bonus. Excellent sound. Intuitive controls. Surprisingly fast attack. Titanium 1B is a superb bonus. Looks beautiful. No way to link bands. Graphics bug in Logic Pro X. Some latency. Acustica Audio's Acqua engine enables the construction of powerful effects plugins using its VVKT technology - multisampled impulse responses, in simple terms - that accurately emulate the sound of a given hardware unit, at the expense of increased latency and CPU consumption in comparison to the average algorithmic equivalent. Titanium is the latest Acqua plugin - well, plugins (VST/AU), actually, since there are three of them. We're mainly covering Titanium 3B here, as the other two differ from it only in the number of processing bands on offer. Though not explicitly billed as an emulation of any particular hardware unit, Titanium looks very much like it's based on the TubeTech SMC2B. "It's a great success, and we can see it replacing costly hardware equivalents in some studios"
Titanium 3B is built on a more advanced, faster engine than Acustica's previous products, with newly developed envelope followers, so it responds much more quickly to incoming signals, enabling very fast compression attack settings. 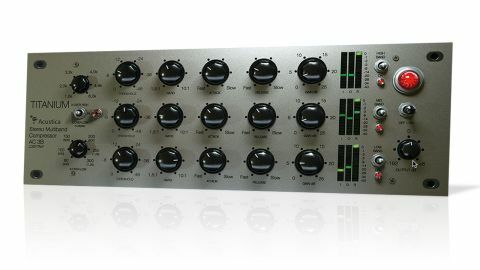 It features three bands of compression, each with a Threshold control ranging from 0-20dB, and Ratio from 1.5-10:1. Attack and Release are provided for each band, as is a Gain knob. Each band also gets a trio of meters: one for relative band input level, another for output level, and the third for reduction level. There are independent 'power' switches for all three bands as well. The X-Over High knob sets the crossover frequency between the mid and high bands, with six fixed options from 1.2-6kHz. X-Over Low, meanwhile, determines the crossover frequency between the low and mid bands, spanning 60-300Hz, with a Multiplier switch shifting the range to 240Hz-1.2kHz. Everything we plumbed through Titanium came out sounding better. Drums became tighter and livelier, bass could be made clearer and more defined, and vocals oozed presence thanks to a subtle (and very natural) harmonic distortion around 1kHz. We also strapped it across a completed mix and compared it to a version of the same mix that had been mastered using traditional algorithmic compression. With a few tweaks, Titanium made the mastered version sound positively murky. If Titanium's design has one flaw, however, it's that there's no way to link the controls for all three bands in order to adjust them collectively: Acustica Audio have stated that this is being considered for an update, though. Additionally, we experienced graphical lock-ups in Logic Pro X - it only affected Titanium and the sound wasn't damaged in any way, though, and we're assured that they're working on this, too. We've always liked Acustica's plugins, but the technology used necessitates a certain amount of latency, and thus they can feel a bit laggy, meaning that when you tweak a control, the change isn't heard immediately. While Titanium isn't as responsive in this regard as the average algorithmic compressor, it is a massive improvement over previous Acqua devices. As the first multiband compressor in the 'sampled effects' market, it's a great success, and we can see it replacing costly hardware equivalents in some studios. Worth every penny.